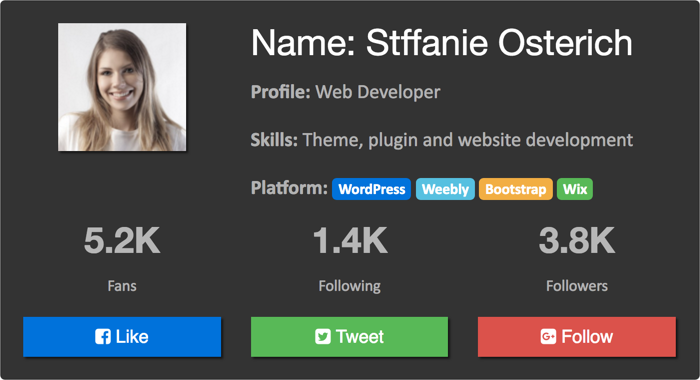 Bootstrap 4 has more powerful components than the previous version 3. Undoubtedly card component is one of the stylish and mobile friendly one among others. Basically you can mix and match the cards to create different types of widgets. 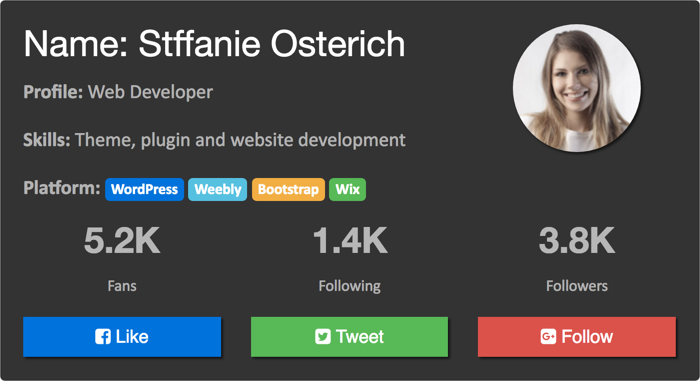 In this article let us discuss, how to create a Bootstrap 4 user profile card widget. Below is how the widget will look and you can customize the colors and look as per your need with the default background color properties. Below is the complete code for the widget. 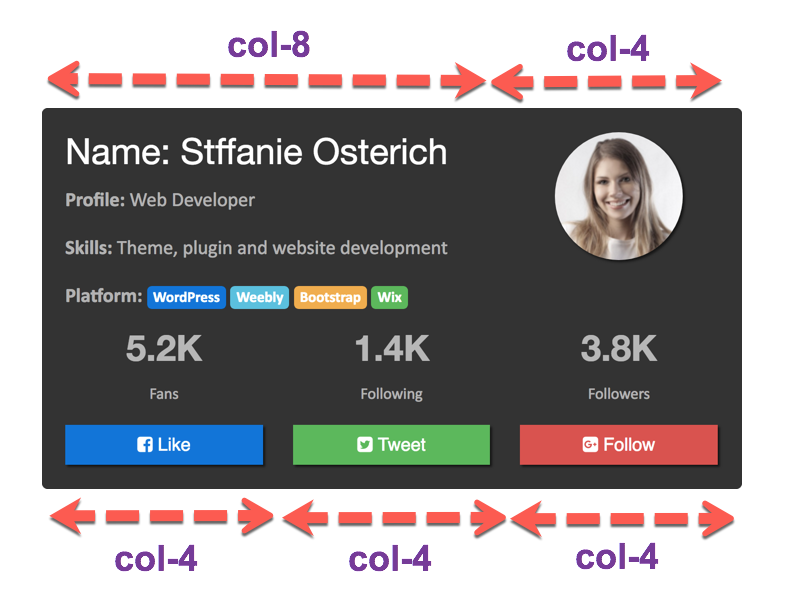 The first three div tags with “container-fluid”, “row” and “col-12” are ideally not required for a single widget. But we used to ensure that the widget can be inserted anywhere in-between the Bootstrap 4 layout with appropriate margins. Basically there are 5 grids, one with “col-md-8 col-sm-8” and the remaining are with “col-md-4 col-sm-4” classes to split the area. The top section has 8+4 grids and the bottom social section has 4+4+4 grids. Note we have used “md” and “sm” in the grid classes as “col-md-8” and “col-sm-8”. This will create the breakpoints on medium and small devices to have responsiveness. Now the basic layout is ready and the next step is to add content and beautify it. Under first col-8 section, you can add “card-title” and “card-text” as name and profile details. 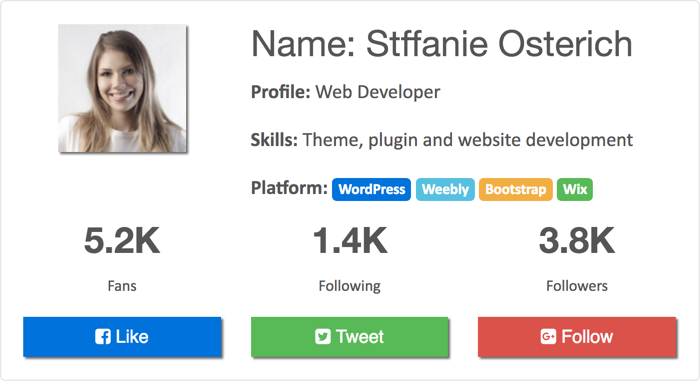 The platform section uses default badge component to highlight the tags in different color. The second col-4 section has a profile picture image with the size as 128×128 pixels. 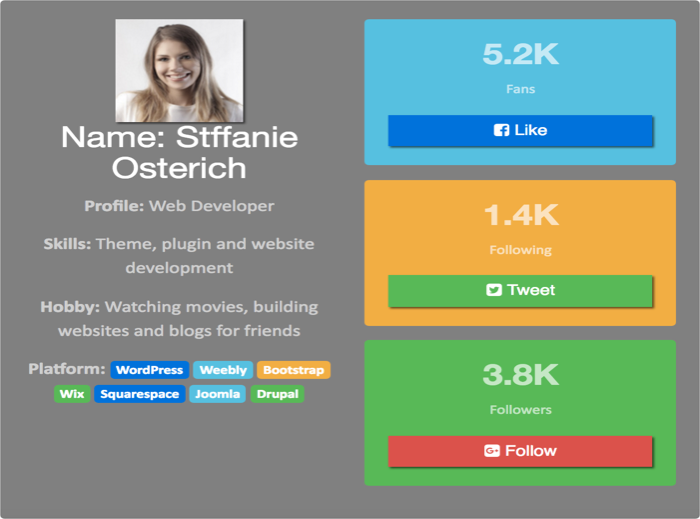 Bottom section has three “col-4” sections having social profile links and description. 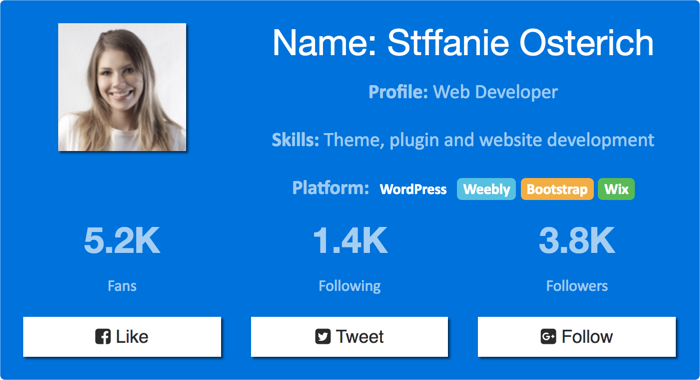 The same CSS class is used with profile image picture to have shadow effect and the inline style “border-radius:50%” is used on the profile picture to change it to circle shape.